In the very late 70's and early 80's when we only had one cable television network, I remember watching a Wings concert movie, I think it was footage from the 1979 UK tour, I remember the lighting and stage setup and I know that it was not Rockshow, I watched the replay at least three more times when it aired. It burned a spot into my memory. Songs like Live and Let Die and Band on the Run reached a whole new level of cool for me as I watched them be performed. Paul McCartney and his ensemble became something that I would never forget. The making of Band on the Run was plagued with trouble that seemed to start with the McCartney's deciding to record the album in Lagos, Nigeria. The studio was was under equipped with a faulty sound board and a single 8-track tape machine. This was just the beginning. During one session of recording Paul began gasping and choking for air. Thinking it was something inside the studio causing it, he was taken outside where his condition worsened. Paul eventually passed out from the lack of oxygen and was diagnosed with a bronchial spasm. The band was protested and publicly accused of coming to Nigeria to steal and exploit the music and sounds of Africa by political activists and local musicians. After one night of recording Paul and Linda were mugged, notebooks containing lyrics, demo tapes and personal valuables were taken. Lagos was not the exotic paradise locale that McCartney was hoping for. The album turned out to be worth all of the trouble. Here in America the album reached number one on albums sales charts three diffrerent times and would sell over three million copies. 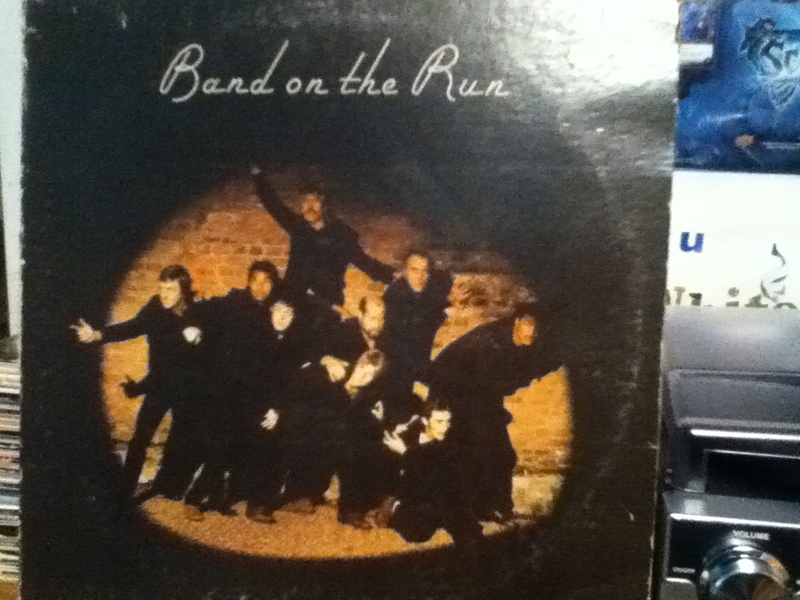 Band on the Run peaked on thirteen international album sales charts, reaching number one on seven of them. The album is loaded with some great songwriting and musical composition. The title track is a masterpiece all on its own, and I could go on and on about that song alone. I can listen to that song over and over with the tiny crackles and occasional pop when putting needle to vinyl. I love that song. Both sides are solidified with the likes of Jet, Mrs. Vandebilt, Helen Wheels and Picasso's Last Words. On a sidenote, as I slowly add to my vinyl collection and work through playing the albums, it is incredibly rewarding to see my kids get into the music, especially when they haven't realized that they're doing it and it's fun when they try to deny it. I'm going to have to get sneak some video of that to post.